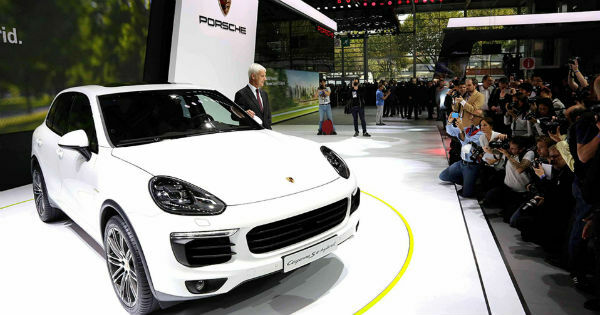 Some nine years ago, Porsche has announced that it will launch a hybrid version of Cayenne model, than only three years later they have introduced their first production version of their hybrid sports SUV. Somewhere in 2010, the first S Hybrid model was shown in the United States, and now we have the second version of 2015 Porsche Cayenne S E Hybrid that was officially unveiled at this year`s Paris Motor Show. The new model is much more powerful, fuel efficient, eco friendly and all that, but the most important thing about it is that it is the very first SUV with a plug-in hybrid system in the premium SUV class. So with this, Porsche is becoming the first car manufacturer that is offering three different variants of plug-in hybrid system on the market: 918 Spyder supercar and Panamera sports sedan. The drivetrain is the same as the one seen at its predecessor but it has increased output. The 2015 Porsche Cayenne S E hybrid is powered by a supercharged 3.0 liter V6 engine that produces 416 HP and 435 pounds feet of torque and it can hit from 0 to 62 in only 5.4 seconds, with top speed of 151 mph. Pretty impressive, isn`t it? Ugh, just when we think about the 2013 Cayenne! Paris has other shows as well including a major international boat show. Each year boat builders head to Paris to display their latest models, including the brand new Sea Ray Yachts for sale.